My husband and I are both currently serving life sentences for the same crime—a nonviolent drug conspiracy charge. We were incarcerated when our three children were just toddlers. 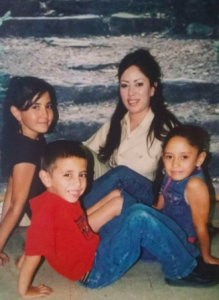 With both parents incarcerated, my children have had an extremely difficult life. My children are now young adults, and still need their mother’s love and support. I pray that someone hears our prayers and allows us another opportunity to be a family. I regret not being able to watch my granddaughter being born. I regret deeply that my children had to go through every great accomplishment and milestone without the presence of a proud parent wearing a smile to cheer them on. I regret profoundly that I was unable to wipe the tears off my children’s faces when they were sad and hurt. I regret most of all the pain I caused them by my absence due to my incarceration. During my incarceration, I have lost several loved ones. My mother and older brother both passed away. My younger brother and a childhood friend have both disappeared and is still currently missing. These losses have been overwhelming and challenging for my family. I hope to be able to take care of them and give them the love and support they need during these hardships. All of these adversities and experiences has taught me the true value of time and cherishing those I love. I am praying that you will grant my clemency and allow for me to care for my children and father in these despairing times. I pray that you will see me as a daughter who wants to care for her father in his suffering for the loss of his wife and three children including myself, a mother who loves her children wholeheartedly, and most importantly a woman of God. My goals are to serve God; because while incarcerated, I have learned that his will is the path I want to follow and the solution to all of our problems. For the last five years, I have overseen the Christian chorus which has filled my heart with joy and happiness. Together my sisters and I find support and strength in Christ and continue to live our lives through Christ. In addition to my father and three children, I also have two sisters, nephews, nieces, brothers, sisters in law and many friends who will give me the support I need upon my release. The desire for us to reunite as a family has motivated us to become better people. I have taken many courses/programs and have learned several skills and trades. I have enjoyed and taken photoshop and illustrator classes. Although, what I find to be most fulfilling is being able to mentor some of the young women here. I have strong desires to give back to my community and assist others in finding a more positive and productive path in life. My aspiration to become a better person in spite of my situation has led me to maintain a position in the Safety Department for eight years. I have also taken forklift driving, OSHA standards and pest control classes, which are offered by my supervisors—Mr. Reed and Mr. Blassingame. I would like to express my most sincere apologies for the harm that I have caused in my community by my poor judgment and awful actions. I broke societal norms and for that I am deeply remorseful. However, I ask that you don’t let me die in prison, please give me another opportunity to be a productive asset to society. I pray that you will give me another chance to be a mother to my children. My family is waiting for me with open arms. I plead that you will please consider granting me clemency.